Posted bysmtraphagen	 March 6, 2015 1 Comment on re: Only Days Away–Countdown to Restauarant Week in Buffalo NY! Starting Monday March 9th, Restaurant Week begins in Western New York. For those of you not familiar, every year nearly 200 local restaurants offer special discount menus that will allow customers to experience an entire meal for just $20.15. As the culinary culture has grown in WNY, so too has the list of restaurants that participate every year. This year, I must say the list is quite impressive. With a flare for the dramatic, and a swath of cuisines that cover every neighborhood, Local Restaurant week represents a wide range of establishments from dive dining to fine dining. Digestion Suggestion has put together some of the best places to check out during next week’s restaurant week. Bourbon and Butter: The newly opened dining/cocktail restaurant features smaller portions, so visitors can sample & share. Located in Hotel Lafayette, the atmosphere is relaxed, hip, and puts you in a spirited mood. Oshun: This sister restaurant to Shango, has the story to back up the food. Small plates and four course options allow for everyone in your party to share. Underwater fresco murals adorn the walls, and the raw oyster bar can’t be missed. Do me a favor and order the popcorn scallops–this odd couple pairing literally leaves you dreaming of popcorn and scallops. Osteria 166: Nicholas Pitillo has created a family friendly atmosphere that allows you to sit back and enjoy great food, great wine and great company. The name alone tells you what to expect; in Italian Osteria means tavern, pub or public house. 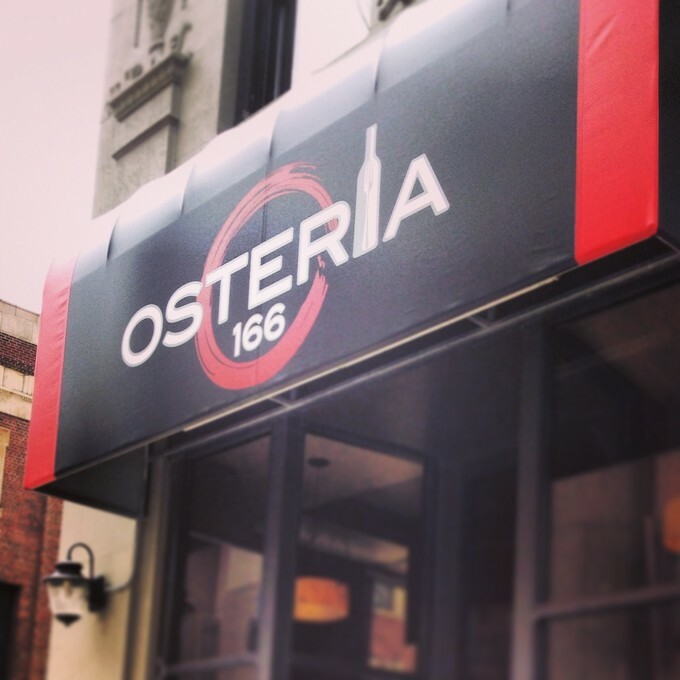 Osteria 166 is quickly rising to the top of favorite authentic Italian restaurants to check out in 2015. The stuffed pepper risotto cakes and sausage/campanelle are simply divine. Tell them Digestion Suggestion sent you! Mangia Ristorante and Caffe: Not everything is city central! That’s the whole point to restaurant week. I highly recommend traversing the roads of the south towns to check out Mangia’s; a great upscale restaurant with beautiful views of Orchard Park. Serving up gourmet pizzas, seafood, and wraps, this is a great place to sit and enjoy a glass of wine and great conversation. SATO: A modern take on Japanese, this beautifully renovated space is located in the heart of Buffalo’s Elmwood Village. It’s an upscale yet casual restaurant, with fresh food that is healthy, sophisticated, with a touch of authentic Japanese flavors blending with local and seasonal ingredients.